Using exclusively designed and fabricated Smith Performance Specialties race components which are constructed in accordance with current N.H.R.A. rules and SFI Specs. 4 link components and hardware are zinc dichromate plated. Double adjustable Strange and Koni shocks have special valving for specific applications. Selection of shocks depends on your particular application. Custom valving is available on request. These shocks require the upper and lower shock mount kit engineered by S.P.S. Upper and lower shock mounts bolt to OEM A-arms and upper mounts (N.H.R.A. legal), but replace stock pliable rubber mounts for more positive shock action. 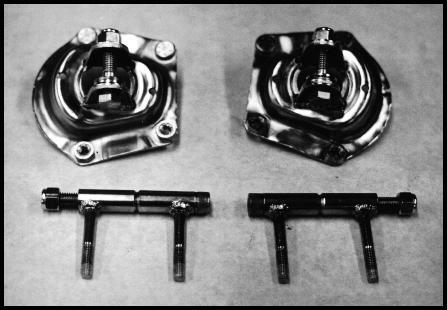 Both upper and lower mounts adapt to 1/2” spherical type mounts - the standard found on all quality coil-over shocks. Includes all necessary hardware and zinc dichromate plated for appearance. Constructed to connect the rack and pinion to your steering column. Features chrome-moly shaft with Borgenson U-joints splined to fit the rack and pinion and to weld to your column shaft. Available welded or in kit form. 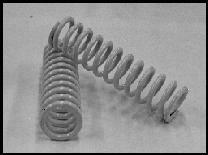 High silicone coil-over type springs are available in different rates for your particular application. Let our experience choose the correct front springs for your race car for maximum stored energy and control. Smith Performance Specialties offers this new OEM replacement 71-72 Pinto rack and pinion. Factory mounting locations make professional installation possible. This unit features a chrome center tube and a polished housing. Available with tie-rod extensions, left-hand chrome moly adapters, bump steer bushings, and hardware. Heavy duty front spindle, hub, and brake kit especially built by Strange Engineering to fit 1993-2002 Firebird and Camaro cars meet with N.H.R.A. Super Stock standards. Now legal in Stock Eliminator - shed many valuable pounds! Kit features light weight billet aluminum front hubs and dust caps with Timken® bearings and seals, alloy spindle and adapters, billet caliper brackets, Strange billet aluminum 4 piston calipers and brake pads, forged steel slotted rotors, and all required fasteners and wheel studs. Steering knuckle requires modification to install this kit. Instructions included to perform modification or can be done by Smith Performance Specialties.